9:1 I am speaking the truth in Christ—I am not lying; my conscience bears me witness in the Holy Spirit— 2 that I have great sorrow and unceasing anguish in my heart. 3 For I could wish that I myself were accursed and cut off from Christ for the sake of my brothers, my kinsmen according to the flesh. 4 They are Israelites, and to them belong the adoption, the glory, the covenants, the giving of the law, the worship, and the promises. 5 To them belong the patriarchs, and from their race, according to the flesh, is the Christ who is God over all, blessed forever. Amen. 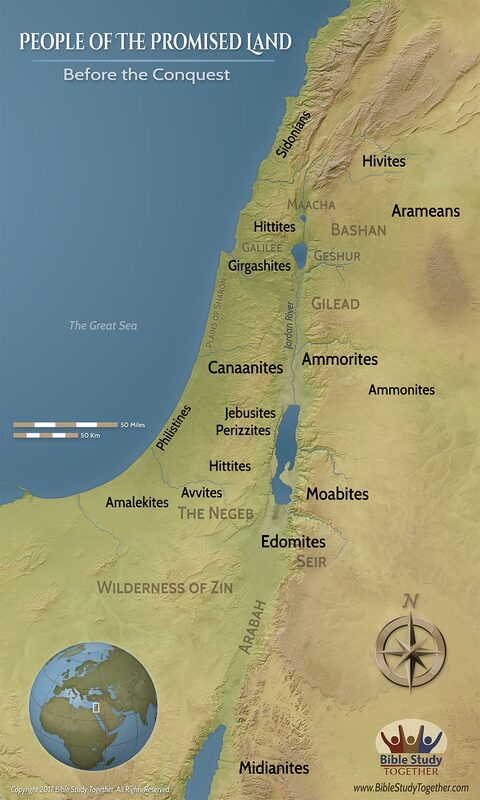 1When the LORD thy God shall bring thee into the land whither thou goest to possess it, and hath cast out many nations before thee, the Hittites, and the Girgashites, and the Amorites, and the Canaanites, and the Perizzites, and the Hivites, and the Jebusites, seven nations greater and mightier than thou;2And when the LORD thy God shall deliver them before thee; thou shalt smite them, and utterly destroy them; thou shalt make no covenant with them, nor show mercy unto them:3Neither shalt thou make marriages with them; thy daughter thou shalt not give unto his son, nor his daughter shalt thou take unto thy son.4For they will turn away thy son from following me, that they may serve other gods: so will the anger of the LORD be kindled against you, and destroy thee suddenly.5But thus shall ye deal with them; ye shall destroy their altars, and break down their images, and cut down their groves, and burn their graven images with fire.6For thou art an holy people unto the LORD thy God: the LORD thy God hath chosen thee to be a special people unto himself, above all people that are upon the face of the earth.7The LORD did not set his love upon you, nor choose you, because ye were more in number than any people; for ye were the fewest of all people:8But because the LORD loved you, and because he would keep the oath which he had sworn unto your fathers, hath the LORD brought you out with a mighty hand, and redeemed you out of the house of bondmen, from the hand of Pharaoh king of Egypt.9Know therefore that the LORD thy God, he is God, the faithful God, which keepeth covenant and mercy with them that love him and keep his commandments to a thousand generations;10And repayeth them that hate him to their face, to destroy them: he will not be slack to him that hateth him, he will repay him to his face.11Thou shalt therefore keep the commandments, and the statutes, and the judgments, which I command thee this day, to do them.12Wherefore it shall come to pass, if ye hearken to these judgments, and keep, and do them, that the LORD thy God shall keep unto thee the covenant and the mercy which he sware unto thy fathers:13And he will love thee, and bless thee, and multiply thee: he will also bless the fruit of thy womb, and the fruit of thy land, thy corn, and thy wine, and thine oil, the increase of thy kine, and the flocks of thy sheep, in the land which he sware unto thy fathers to give thee.14Thou shalt be blessed above all people: there shall not be male or female barren among you, or among your cattle.15And the LORD will take away from thee all sickness, and will put none of the evil diseases of Egypt, which thou knowest, upon thee; but will lay them upon all them that hate thee.16And thou shalt consume all the people which the LORD thy God shall deliver thee; thine eye shall have no pity upon them: neither shalt thou serve their gods; for that will be a snare unto thee.17If thou shalt say in thine heart, These nations are more than I; how can I dispossess them?18Thou shalt not be afraid of them: but shalt well remember what the LORD thy God did unto Pharaoh, and unto all Egypt;19The great temptations which thine eyes saw, and the signs, and the wonders, and the mighty hand, and the stretched out arm, whereby the LORD thy God brought thee out: so shall the LORD thy God do unto all the people of whom thou art afraid.20Moreover the LORD thy God will send the hornet among them, until they that are left, and hide themselves from thee, be destroyed.21Thou shalt not be affrighted at them: for the LORD thy God is among you, a mighty God and terrible.22And the LORD thy God will put out those nations before thee by little and little: thou mayest not consume them at once, lest the beasts of the field increase upon thee.23But the LORD thy God shall deliver them unto thee, and shall destroy them with a mighty destruction, until they be destroyed.24And he shall deliver their kings into thine hand, and thou shalt destroy their name from under heaven: there shall no man be able to stand before thee, until thou have destroyed them.25The graven images of their gods shall ye burn with fire: thou shalt not desire the silver or gold that is on them, nor take it unto thee, lest thou be snared therein: for it is an abomination to the LORD thy God.26Neither shalt thou bring an abomination into thine house, lest thou be a cursed thing like it: but thou shalt utterly detest it, and thou shalt utterly abhor it; for it is a cursed thing. 1I say the truth in Christ, I lie not, my conscience also bearing me witness in the Holy Ghost,2That I have great heaviness and continual sorrow in my heart.3For I could wish that myself were accursed from Christ for my brethren, my kinsmen according to the flesh:4Who are Israelites; to whom pertaineth the adoption, and the glory, and the covenants, and the giving of the law, and the service of God, and the promises;5Whose are the fathers, and of whom as concerning the flesh Christ came, who is over all, God blessed for ever. Amen.6Not as though the word of God hath taken none effect. For they are not all Israel, which are of Israel:7Neither, because they are the seed of Abraham, are they all children: but, In Isaac shall thy seed be called.8That is, They which are the children of the flesh, these are not the children of God: but the children of the promise are counted for the seed.9For this is the word of promise, At this time will I come, and Sarah shall have a son.10And not only this; but when Rebecca also had conceived by one, even by our father Isaac;11(For the children being not yet born, neither having done any good or evil, that the purpose of God according to election might stand, not of works, but of him that calleth;)12It was said unto her, The elder shall serve the younger.13As it is written, Jacob have I loved, but Esau have I hated.14What shall we say then? Is there unrighteousness with God? God forbid.15For he saith to Moses, I will have mercy on whom I will have mercy, and I will have compassion on whom I will have compassion.16So then it is not of him that willeth, nor of him that runneth, but of God that showeth mercy.17For the scripture saith unto Pharaoh, Even for this same purpose have I raised thee up, that I might show my power in thee, and that my name might be declared throughout all the earth.18Therefore hath he mercy on whom he will have mercy, and whom he will he hardeneth.19Thou wilt say then unto me, Why doth he yet find fault? For who hath resisted his will?20Nay but, O man, who art thou that repliest against God? Shall the thing formed say to him that formed it, Why hast thou made me thus?21Hath not the potter power over the clay, of the same lump to make one vessel unto honour, and another unto dishonour?22What if God, willing to show his wrath, and to make his power known, endured with much longsuffering the vessels of wrath fitted to destruction:23And that he might make known the riches of his glory on the vessels of mercy, which he had afore prepared unto glory,24Even us, whom he hath called, not of the Jews only, but also of the Gentiles?25As he saith also in Osee, I will call them my people, which were not my people; and her beloved, which was not beloved.26And it shall come to pass, that in the place where it was said unto them, Ye are not my people; there shall they be called the children of the living God.27Esaias also crieth concerning Israel, Though the number of the children of Israel be as the sand of the sea, a remnant shall be saved:28For he will finish the work, and cut it short in righteousness: because a short work will the Lord make upon the earth.29And as Esaias said before, Except the Lord of Sabaoth had left us a seed, we had been as Sodoma, and been made like unto Gomorrha. What similarities does the wisdom of the psalmist share with Paul’s understanding of election? How can you find encouragement to overcome trials like the Israelites we’re encouraged that they could overcome their enemies? What are the idols of this age that turn people away from God? Who are the true children and people of God? Encourage people not to participate in the idolatry of this world.